The Irish Whale and Dolphin Group says five recorded strandings of Cuvier's beaked whales between 3 and 7 August is "definitely cause for concern". 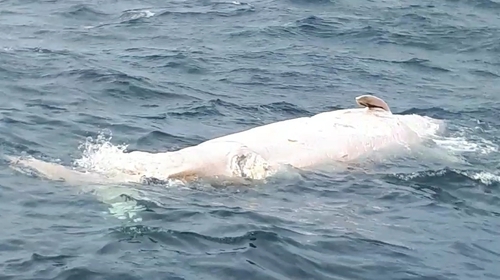 The IWDG says it originally received reports of three dead whales on 4 August in Donegal and Mayo. One animal was in Sheephaven Bay, one on Gola Island and one at Tirraun on the Mullet Peninsula. All three animals had likely been dead for several days and were in poor but similar condition, suggesting the possibility that all three had died around the same time. The IWDG says it has since received two further reported Cuvier's strandings from Omey Island, Co Galway on 3 August and from Cliffony, Co Sligo on 7 August. Dr Simon Berrow, of the IWDG said: "Cuvier's beaked whales are a deep diving species and have previously been found to be particularly affected by loud underwater man-made noise, for example naval sonar. "Five recorded strandings of this species in so few days is definitely cause for concern and, as we so often say, is a minimum number, as other dead carcasses may not wash ashore or may go unreported for other reasons." The Irish Navy does not have sonar capabilities but the UK's Royal Navy does, said Dr Berrow. "When investigating these type of incidents, establishing if there has been sonar use is always the first port of call," he added. "There is an exercise military zone to the west of Scotland, west of the Outer Hebrides. If this event occurred in British waters, which it could easily have done, then these animals drifted towards the Irish coast," Dr Berrow said. A Royal Navy spokesperson said: "There is no evidence that the deaths of these marine mammals have been attributed to any Royal Navy Sonar operations, trials or exercises. "We take our environmental responsibilities very seriously and continue to work with the relevant UK authorities to reduce any environmental risk."